IM Creator is perfect for anyone who needs a website. The easy to use builder means even the least techy person can get their site up and running insanely fast. You can also white label our builder. Forget whatever website nightmare youve dealt with before the fact is you already know how to use IM Creator. Our tools function intuitively, like the applications you use every day, and there are no complicated technical aspects to hinder your creativity. Our templates are FREE to use, FREE to edit, and completely mobile responsive. Furthermore, our builder can be fully white-labeled and used to create a complete website-building business by entrepreneurs and agencies. IM Creator Reviews Recently Reviewed! Pros: With so many website builders available in the contemporary web building niche, it's not easy to choose the one, which will be the best value for your money. Having tested and compared dozens of services, I've defined several leaders that are worth the attention of users with diverse web building experience and skills. One of these leaders is IM Creator. This is a free cloud website builder that is a nice choice for users, who intend to launch decent websites with minimum hassle, waste of effort and time. The service features convenience, ease of use and affordability - this is exactly what most users need to start their web projects. What differs this website builder from lots of other similar web building tools is its orientation on people of creative professions, who wish to launch websites with the only idea in mind - to display their works to the target audience. At the same time, the website builder is a decent solution for the owners of small/medium businesses, who wish to establish reliable web presence. Whether you plan to launch a portfolio, a business website, a landing page or a promo website, IM Creator is always at your disposal! Pros Simplicity and Convenience. IM Creator features simplicity and convenience. It comes with a user-friendly and intuitive interface, which ensures smooth and hassle-free web building process. As a result, all websites created with this website builder are easy-to-navigate, which is a benefit for inexperienced users. The web building process itself does not take longer than a couple of hours, while the result always adheres to the highest industry standards. eCommerce and Blogging Functionality. With IM Creator, you can build different types of websites, including blogs and eCommerce websites. This contributes to the application sphere of the service and expands your web building options. Responsive Templates and Design Customization Options. IM Creator can boast an extensive gallery of high quality responsive templates. They fall into thematic categories, which allows choosing the template that meets your industry needs and objectives most of all. To give the template the required design and performance, you are welcome to set up design customization options (selecting fonts and icons, animation effects, creating slideshows, image galleries etc.) available in the control panel. This is fast and effective. Free Plan for Ordinary Users and Non-Commercial Organizations. One of the features that distinguish IM Creator from other similar website builders is that it offers a free plan for ordinary users, students, creatives and non-commercial organizations. This plan doesn't have any limitations and ensures decent result. White Label Solution. Professional web designers have a nice chance to make use of the White Label solution, which implies using the features of the system under the required brand name. The option allows creating multiple websites with stunning functionality, enjoying their quality and advanced SEO characteristics. White Label solution is a nice choice for hosting companies, web design experts and resellers. Cons: No Template Change Option. IM Creator is one of those website builders, which do not provide an opportunity to change the template during the web building process without the loss of the submitted content. This is a demerit for users with little or no web design skills. Pros: Absolutely costumixable, a lot of templates that no have restrictions to mofify absolutely. Access to code. Cons: I always thinking that the platform has to have a onñline xat suport. Not only by email and FAQ. The users need a fast chat to give solutions faster. Comments: I had a website for about five years now and it felt very outdated. 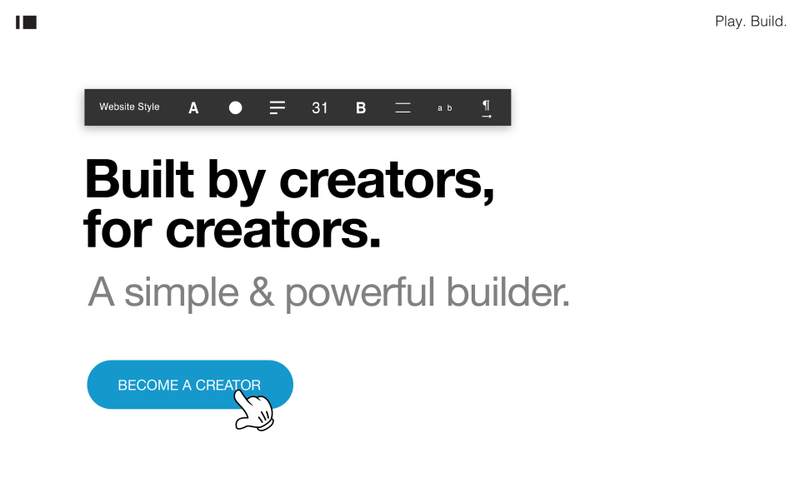 I searched online to find an easy website builder and one of those I encountered was IM Creator. Very simple interface, nice templates - overall, pleasant experience building my website.